Muscat, Nov 7: Gulf Voice of Mangalore Season 4, the reality show that enthralled audiences not only across the GCC countries but also the entire world, a journey which started months ago in the six GCC countries, culminated in a grand manner at Al Falaj hotel in Ruwi here late night on Friday November 7. After months of rigorous competition, hard work, regular practice sessions, and ultimately, performances that won the judges' hearts, Joshal D'Souza from UAE and Morvine Quadros from Kuwait were crowned the winners in the female and male categories. Sana Britto from Qatar and Harry Correa from Qatar were the first runners-up and Pramila Rodrigues from Saudi Arabia and Sachin Lobo from Oman were declared the second runners-up. The torch to host the Gulf Voice of Mangalore was handed over to Oman this year. Oman humbly took this responsibility and the world saw Oman stage the mega singing reality show in all its glory and splendor. The contest saw keen participation from Bahrain, Kuwait, Qatar, Saudi Arabia, the Sultanate of Oman and the United Arab Emirates, with 12 singers, two from each of these countries, making it to the finals in Muscat. The grand finale was a visual spectacle of sorts with dignitaries from different countries landing to witness this mega event live. The winners received cash prize worth Rs one lac, the second winners received Rs 50,000 and the third place winners were awarded Rs 25,000. The finale was webcast live on daijiworld.com. Ecstatic and overwhelmed with their win, Joshal and Morvine said that their joy knew no bounds. The finale began with the judges, dignitaries and sponsors being escorted by members of the steering committee, headed by its president Stanley Fernandes. 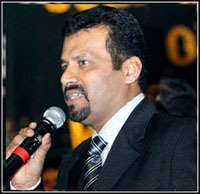 Clarence Pinto welcomed the august gathering on behalf of the steering committee for Gulf Voice of Mangalore Season 4. Fr Albert D’Silva, parish priest of Holy Spirit Church, Ghala led the congregation into a time of prayer, invoking God’s blessing and divine presence at the finale. The Le Grande Hall of Al Falaj Hotel Muscat erupted in defeaning applause and cheers as the audience gave a standing ovation and a befitting welcome to all the finalists as they marched gracefully into the hall with their minds and eyes on the coveted trophy. Leading the guard of honour were representatives of the MCCP Oman carrying four flags of Gulf Voice of Mangalore, symbolizing the fourth edition of the Gulf reality singing competition. The contestants were accompanied by their country coordinators as they walked in carrying their country flag with pride, all set to make the country they represent proud. Stanley Fernandes, in his presidential address thanked all sponsors, benefactors and all who helped make this event a success. He wished all the contestants the very best. Main sponsor for Gulf Voice of Mangalore - Ronald Colaco - could not make it to the event due to prior commitments. Nonetheless, he sent his message, which was read out by Clarence Pinto. Colaco wished all the contestants the very best and prayed to God for the success of the fourth edition of Gulf Voice of Mangalore. It has been a tradition in Mangalore to inaugurate every function with the lighting of the lamp. To carry out this honorable tradition, Clarence Pinto welcomed on stage Lawrence Pinto, president, youth Creation centre, Kuwait; Louis Rodrigues, Gulf Voice of Mangalore Main Coordinator from Kuwait; James Mendonca, president, Mangalore Konkans, United Arab Emirates; Arthur Pais, president, Mangalore Cultural Association, Qatar; ArunPalimar and Clifford Arun D’souza, president, Aangann Konknnechem from Saudi Arabia; Henry D’almeida, president, Konkani Kutam, Bahrain; Prescilla Menezes, president, Mangalorean Catholic Centre of the Parish (MCCP), Oman; guests of honour for the function Roy Castelino, Michael D’Souza, Walter Nandalike and LigouryD’mello; Fr Albert D’silva, parish priest, Holy Spirit Church, Ghala and Stanley Fernandes, presdient of steering committee for Gulf Voice of Mangalore-Season 4, Oman. The dinataries brought light into the function as they lit the lamp. The members of the band then played the tune of a soothing instrumental number. Clarence Pinto handed over the microphone to ace compere Leslie Rego who then took charge of the entire competition. It was quite evident that eloquence was his forte as he took centre stage. With all formalities over, the most awaited session - the competition - began even as the contestants took their seats on the stage. The daunting task of judging was handed over to four prominent names in the music Industry. The panel of judges for the grand finale consisted of Fr Valerian Mendonca, Ivan Sequeira, BabitaD’sa and Alwyn Noronha. The judges were honoured and welcomed with a bouquets. The twelve finalists were Morvine Quadros and Shaila Lobo from Kuwait; Vincent Rodrigues and Joshal Sweeda D’Souza from United Arab Emirates; Harry Correa and Sana Britto from Qatar; Roshan Philip Rodrigues and Pramila Rodrigues from Saudi Arabia; Vijeth Cliston D’Silva and Larisa Miranda from Bahrain; and Sachin Lobo and Josma Rodrigues from Oman. The finale saw three rounds with all the twelve finalists singing in the first and second rounds. Six best voices, three male and three female, made it to the third round. The contestants cleared their throats and got ready to face the night of their lives. The competition thus began. The female contestants sang first, followed by the male contestants. Melody and harmony moved in the air as the contestants sang the best of Konkani numbers from renowned singers. The audience swayed to the music and enjoyed the musical treat thoroughly. Sponsors for Gulf Voice of Mangalore-Season 4 were felicitated and honoured with momentos for their continued support and valuable contribution. 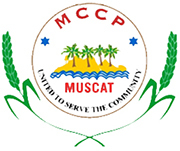 Budding dancing talent from MCCP Oman set the stage ablaze as they danced to the tunes of hit Konkani numbers. The dance was choreographed by Priyanka and the members of the group were Rebecca, Roshal, Erica, Jenilda, Jason and Priyanka. As round two began, contestants had to sing according to the pitch set by the musicians. No musical accompaniment was provided. Contestants had to stay on pitch throughout the song given to them by the judges. All the twelve contestants were presented momentos as a token of appreciation and encouragement. The entire journey of Gulf Voice of Mangalore right from the first season to the current edition was unfurled in a souvenir beautifully prepared by members of MCCP Oman. The souvenir was released by Walter Nandalike in the presence of members of the steering committee Stanley Fernandes, Henry Martis, Donald Pinto, Clarence Pinto and Suraj Rebello. The souvenir was then distributed to all present to cherish the moments of this musical journey. MCCP Oman is filled with talented teens. Lenita, Shaina, Megan, Rishita, Joshua, Alston, Vijeth and Dale enthralled the audience as they danced to peppy Konkani numbers. The dances were choregraphed by Sonia D'Souza, Melanie Crasta and Brian Monis. the musicians were honoured with souvenirs for their dedication and excellence. The choreographers Sonia D’Souza, Melanie Crasta, Priyanka and Brian Monis were honoured as well for having taken the time out to teach the dancers who put up scintillating performaces. The scores were tallied and judges chose the final three ladies and final three men who would battle it out to win the coveted title. The finalists were Voice of Saudi Arabia Pramila Rodrigues, Voice of Qatar Sana Britto and Voice of UAE Joshal D’Souza in the female category, and in the male category, Voice of Kuwait Morvine Quadros, Voice of Qatar Harry Correa and Voice of Oman Sachin Lobo. In the final round, the female contestants had to sing ‘Valcha Wudhkak Mog Dharya So’, a famous number of MickMax. The male contestants were given ‘Saunsaranth Kithe Aasaa’ composed by the one and only Wilfy Remimbus. As the competition drew to a close and the final marks were being calculated, the judges were felicitated with momentos .The judges then took the stage and swept everyone off their feet with a beautiful rendition. Henry Martis proposed the vote of thanks, expressing gratitude to the sponsors, guests of honour, members of the steering committee and the executive committee of MCCP Oman, dignitaries from other GCC countries and all who have contributed in making the fourth edition of Gulf Voice of Mangalore an overwhelming success and a milestone that will go down in history. The Gulf Voice of Mangalore Season 4 hosted by Oman has been successful yet again in unearthing brilliant talent who are sure to make a big mark one day in the music industry. 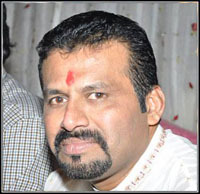 Gulf Voice of Mangalore has since its inception garnered worldwide appreciation. Yet another season has come to an end and the audiences near and far await the next season as new talents get unfurled.